Aven is may first sail and oar design. From 1982, about 100 units have been built by Chantier Naval de Loctudy. She is strip planked over steam bent frames. Hull forms are inspired by traditional boats of Brittany, with a plumb stem and a raked transom. The “misainier” rig, a standing lug without boom, is both easy to use and efficient, thanks to her highly peaked yard. When tacking, the helmsman has just to change the sheet from side to side. 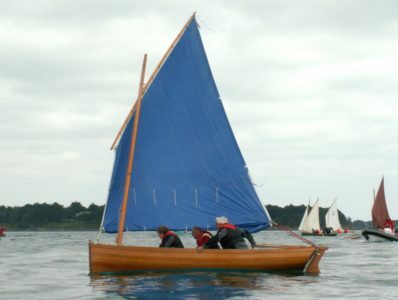 Aven is fitted with a daggerboard to improve windward ability.